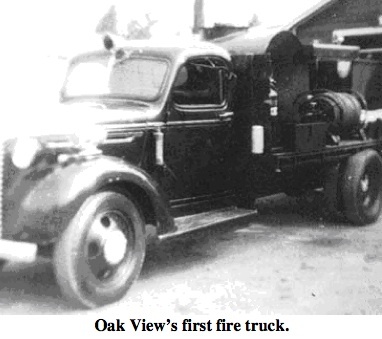 Oak View’s first fire station was established in 1938, when the County Fire Protection District delivered a flat bed Chevy truck, with a 300-gallon water tank and a 500 gallon-per-minute pump driven by a Chrysler auxiliary engine, to the Oak View Road station. A small amount of hose was also carried on the truck. In 1946, Engineer Wayne Troxell was put in charge of the Oak View station and its volunteer group. The title, Engineer, was later changed to Captain and the titles of the four Captains in charge of the four districts in the county were changed to Battalion Chief. The Engineer’s title was not used again until 1962. At that time working hours were reduced from four 24-hour days on and 48-hours off to a schedule of two 24-hour days, one eight-hour day on, and 48-hours off. The new engineer position covered the station Captain’s two days off and worked with the Captain only eight hours of his three days on. Troxell, his wife, and children lived in a small trailer parked behind the station. In 1948 a new two-stall fire station with living quarters for Wayne and his family was built at 15 Kunkle Street in Oak View. 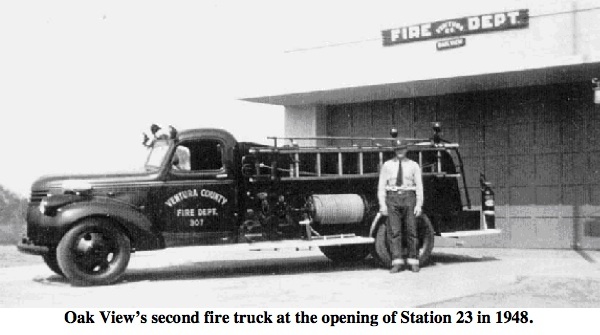 In 1952, Troxell resigned and built a number of buildings and homes in the county, including Station 20 and Station 35. Glen Tremain, the second man hired for Oak View, lived at the station with his wife in an eight-by-ten room, cooking meals on a small two-burner stovetop. Glen served the district for a number of years until he retired as Captain of the Ojai fire station. The Oak View fire station has the distinction of owning the first resuscitator unit in service in the fire district. Donated by the local Lions Club, it marked the beginning of other service clubs donating resuscitators to their local fire stations. In 2000 the station was demolished for today’s Station 23 on the same site. The crew operated out of a trailer across Kunkle Street, in a vacant lot, until the new station was finished.